A group of researchers, led by Jon Camden, associate professor of chemistry and biochemistry, has reported the first nanoscale mapping of the flow of energy between light-harvesting plasmonic nanoparticles and semiconductor substrates. Plasmonic nanoparticles are important in a variety of applications, including solar energy-harvesting devices, photocatalyic devices, single-molecule spectroscopy, and molecular sensing. They are of particular interest in solar energy-harvesting due to their potential to significantly increase the efficiency of such devices by expanding the solar spectrum available for energy conversion. The work is presented in a paper entitled “Spatially Mapping Energy Transfer from Single Plasmonic Particles to Semiconductor Substrates via STEM/EELS” in Nano Letters. The research team also includes professors David Masiello (Univ. of Washington), Jill Millstone (Univ. of Pittsburgh), and Gerd Duscher (Univ. of Tennessee), post-docs Guoliang Li (ND), Charles Cherqui (Univ. of Washington), and Nicholas Bigelow (Univ. of Washington), and graduate student Patrick Straney (Univ. of Pittsburgh). While previously reported experiments have shown that the addition of plasmonic nanoparticles to semiconductor substrates improves solar light-harvesting, characterization of the pathways for this improvement have not been possible, presenting a critical roadblock in the effort to understand and maximize efficiency improvement in device designs. Previous attempts to study these pathways have relied on optical spectroscopy, which is limited by the diffraction limit. The team addressed this short-coming by using electron energy-loss spectroscopy (EELS) conducted in a scanning transmission electron microscope (STEM). Using Ag nanocubes on substrates, the optical and electronic properties of the substrate were varied (insulator to semiconductor) to isolate the possible modes of energy transfer. Samples were scanned using EELS to map energy distribution at very high resolution. 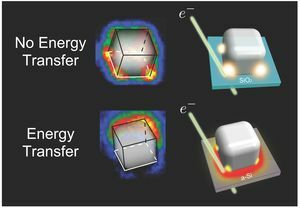 Theoretical models were subsequently developed to deconvolute the electron-transfer and resonant energy transfer mechanisms with nanoscale precision. The results of the study suggest that direct electron transfer (DET) is the dominant mechanism in these systems, even when plasmon-induced resonant energy transfer (PIRET) is also occurring, opening up new possibilities for the design of photo-voltaic devices reliant on DET alone rather than electron-hole pair generation found in traditional devices. This work demonstrates an exciting new method for researchers to use in probing competing energy transfer mechanisms in nanoparticle on semiconductor systems, regardless of ultimate material application. The next steps for the research team will be investigating the effects of other nanoparticle and interface geometries as well as tracking energy transfer in other applications such as nanoscale switching and photocatalysis. Originally published by Rebecca Hicks at chemistry.nd.edu on April 15, 2015.